This post has been so fun to write because it combines three of my favorite things: Christmas, friends, and DIY. We used two different kinds of pillow cases. First, I bought as many of these from Ikea as I could find. For $3, you really can’t go wrong! But, unfortunately, they didn’t have as many as I hoped, so I made a few from drop cloth (left over from my smocked curtains in my living room). I made easy, envelopes and was able to crank out three covers in about 15 minutes. Truly. 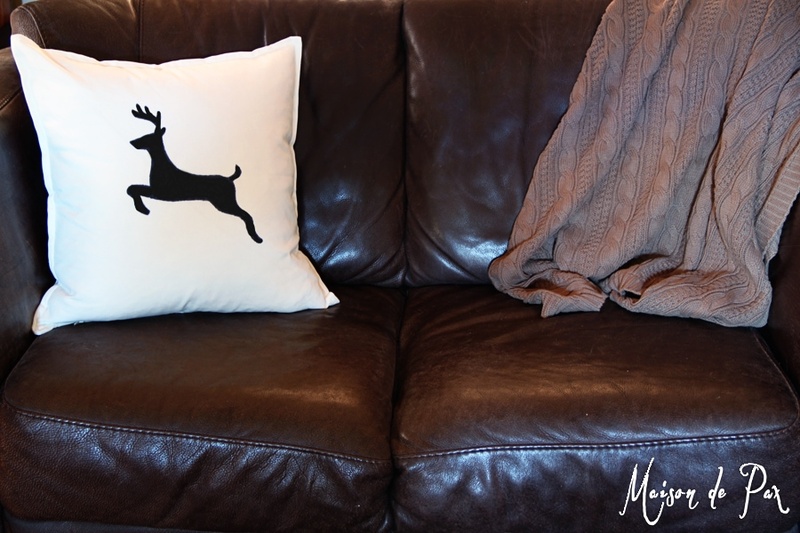 If you want a great tutorial for envelope pillows, visit my friend Krista here. 🙂 The drop cloth ones were not quite as “finished” looking as the store-bought ones, but I love how they turned out, too. I love all the creativity that my friends exhibited. 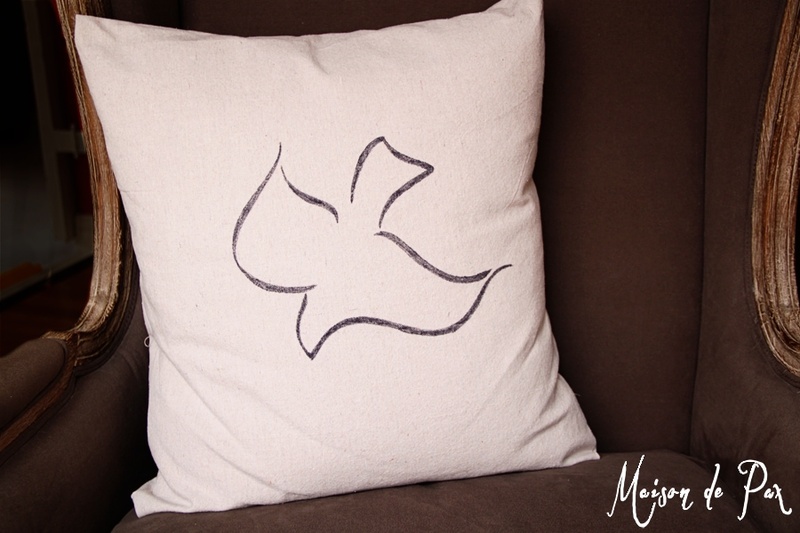 Because I was busy sewing those extra pillow cases last minute, I limited myself to some simple silhouette designs (which I simply found via google images, printed out, cut out, and traced around… then I filled them in to the desired degree – couldn’t be easier!). 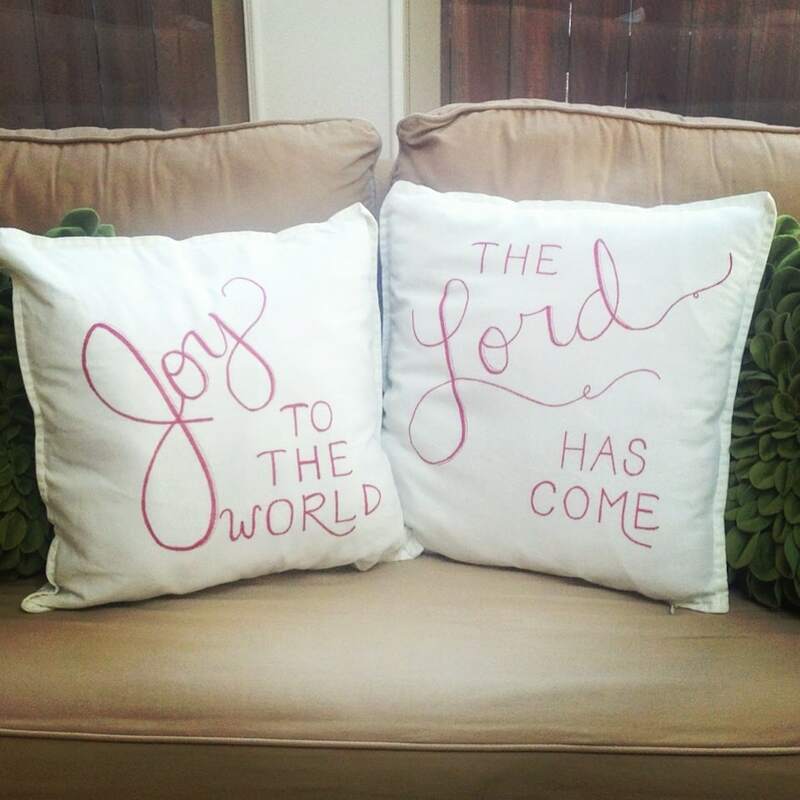 Several of my friends wanted script, though, and the great thing about these off-white pillow cases is that you could trace your font if so desired. We cut butcher paper to the same size as the pillows, made mock-ups of our designs, and then inserted them into the cases to trace for the final result. They turned out so beautiful! 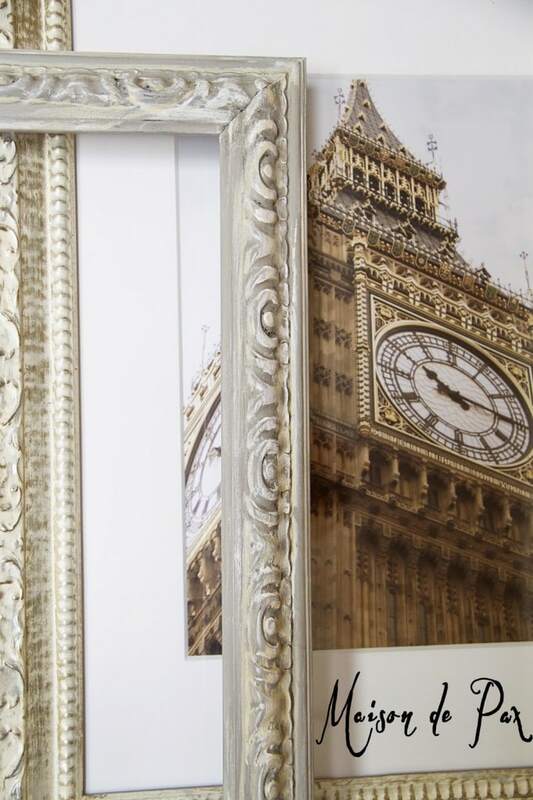 If you follow me on Instagram, you’ve seen these, but I couldn’t resist sharing them again… I love this one that mimics this cover from Pottery Barn (which my friend already had). And another friend made a monogram (which could be used year-round, of course! ), but I don’t have picture, unfortunately. 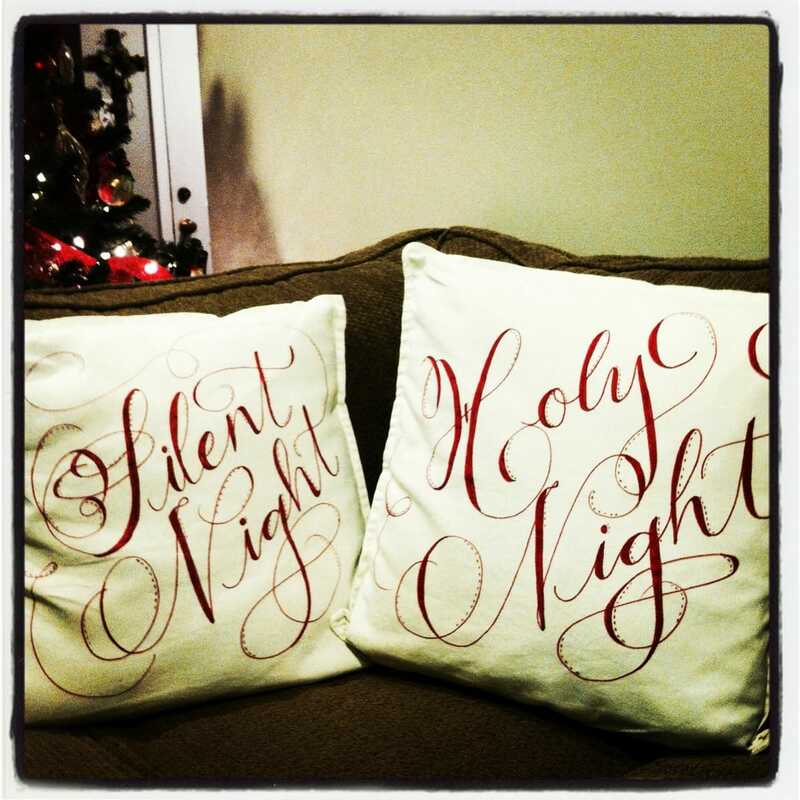 The next ones I want to make are these Silent Night Holy Night ones… Aren’t they fabulous? You’ve got to see a close-up of these. Guess I need to make another run to Ikea and pray they have some more pillow cases! What do you think? 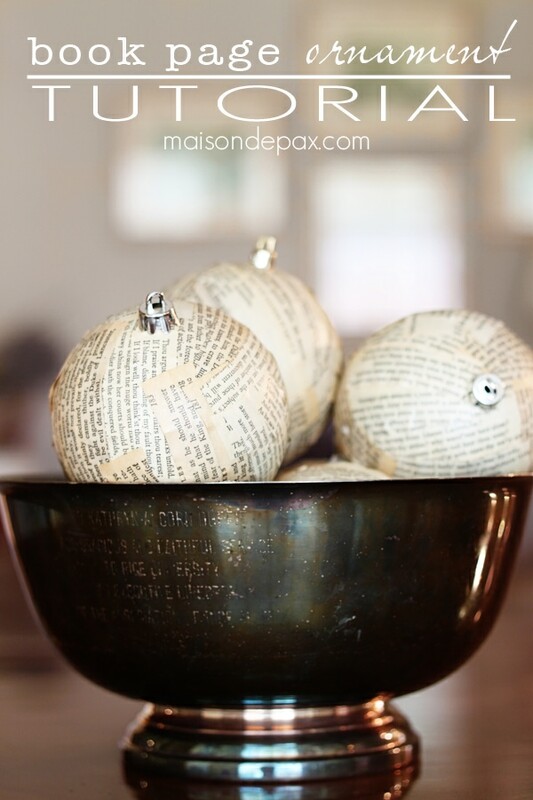 Any other great, embarrassingly easy holiday projects? Do share! 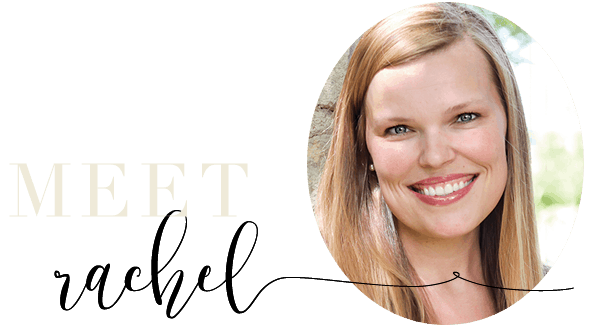 Hey all look amazing Rachel! And what a fun get together! These look amazing. You have beautiful writing and I just love the deer one too! 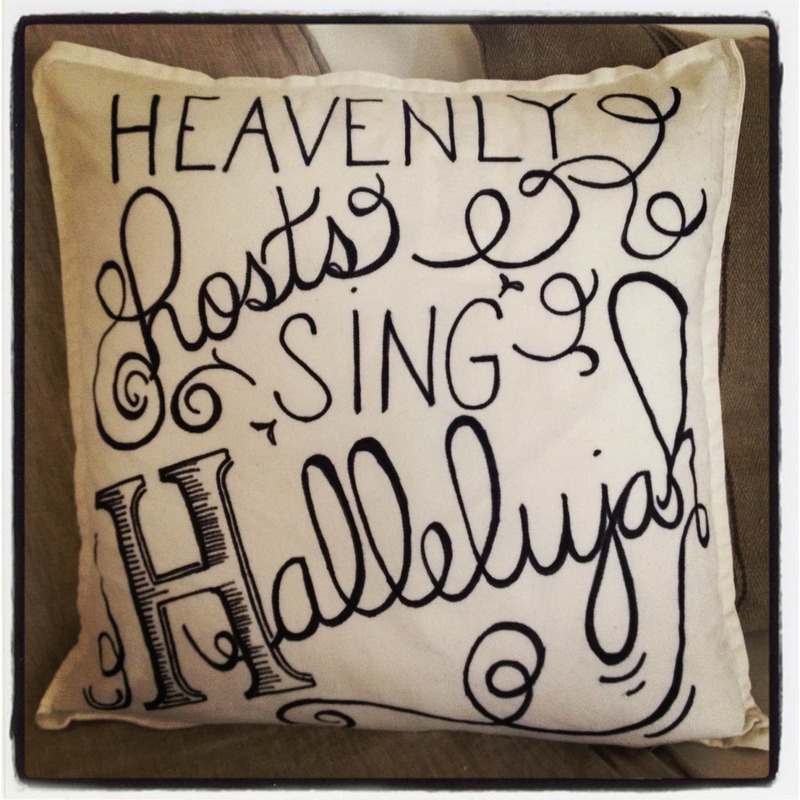 Have you tried washing any of these pillow cases- does the sharpie stay? Thank you so much, Lisa! I’m so glad you like them. 🙂 I have not tried washing them yet, but I figured that even if it faded a bit, I could always touch it up since a Sharpie is a Sharpie… at least I hope that’s the case! 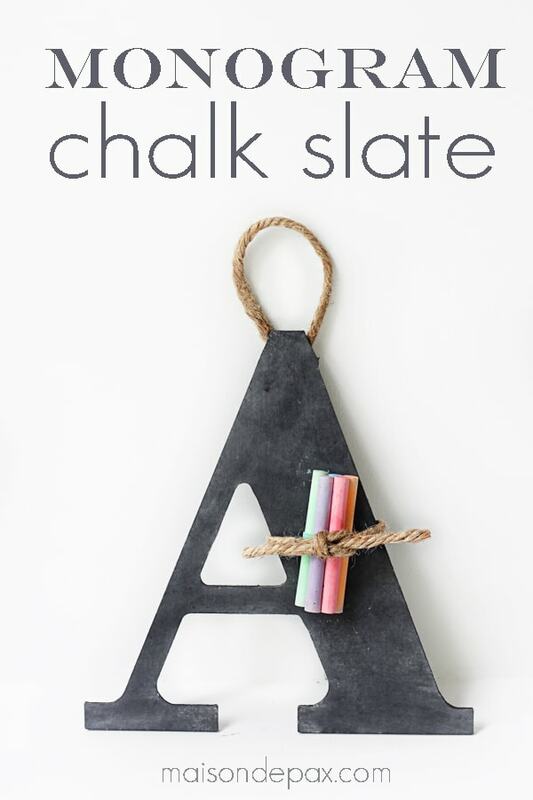 They all look so beautiful – what a great idea! That’s a craft even I could handle! Love all your incredible pillows, wonderful. They all look so much better than the fancy stores sell. You did a wonderful job, sure inspired me. I’m going to try to make a couple flannel pillow covers before Christmas. If not then it’ll have to wait til next year for holiday pillow covers. Will be making other seasons pillow covers tho, can’t stop myself. Hope any I make look half as good as yours. Happy holidays and may good health always be with you. These are incredibly beautiful! I have to go to Ikea! Do you use a regular marker for textiles? So glad you like them, Kathy! Hope you enjoy making some next year. 🙂 Have a great Christmas!! Rachel, Love the pillows! Our Ikea is always out of these pillow covers. I bought a couple months ago and haven’t found more since then. Thanks for sharing how to make these at the Open House party. These turned out swell! I love them and especially the script pillows, although all of them are great! So glad you like them, Kim! I hope you get to enjoy a craft party soon and that you have a very Merry Christmas! These are so cute! I’d love to know how the sharpie washes. I might just mark up a piece of scrap fabric and wash it to see what happens. I was going to make some of my own pillows but now I think I will just be going to ikea. You can’t beat that price. PS Found you on Redoux link party. 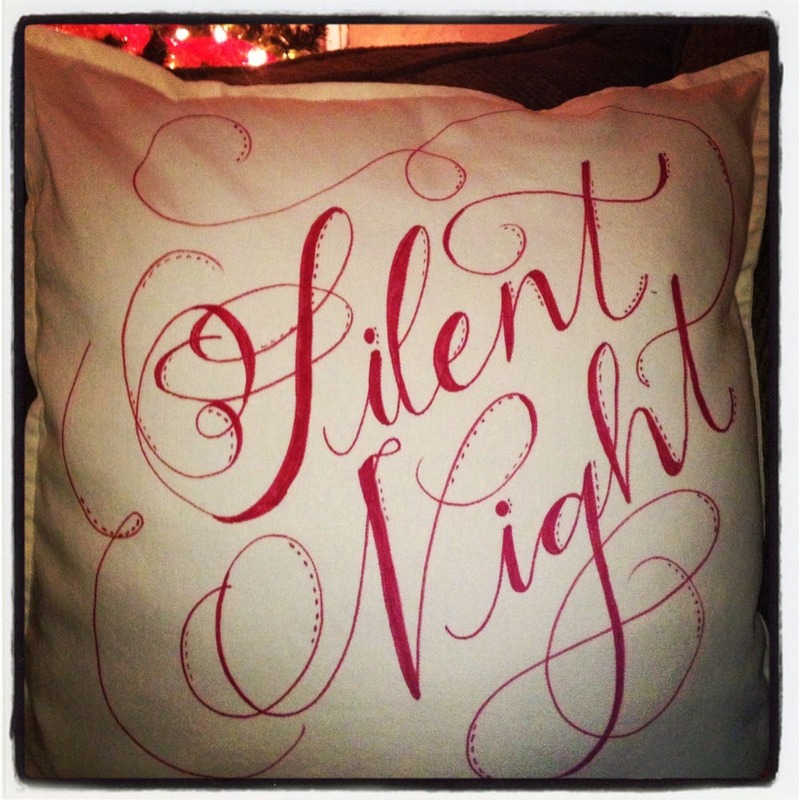 I love the Silent Night pillows! What a great idea! 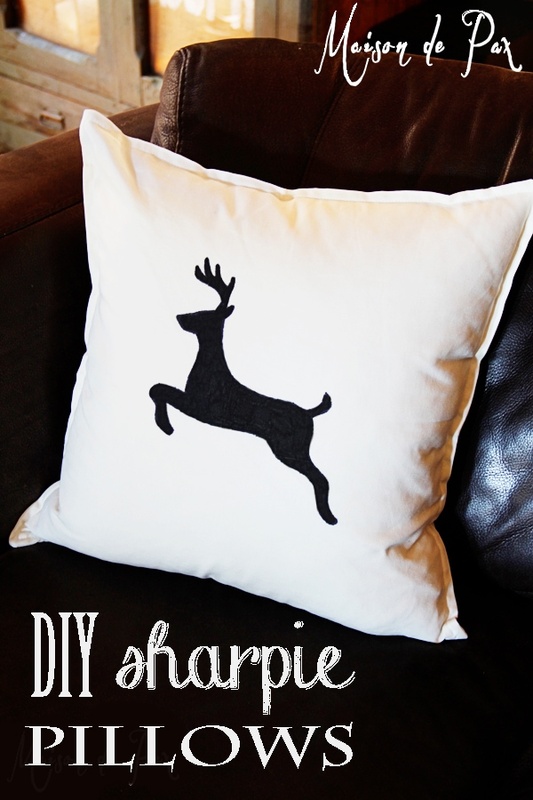 I am obsessed with Sharpies so this is the perfect quick and easy Christmas craft! Hi Brooklyn, I’m so glad you like the project! And yes, they are perfect for year round. 🙂 As for running or smudging, I have not had any trouble with that. Sharpie is not really permanent; it does fade a bit in the wash, but I have never had it run or smudge. I did not wash them immediately after making them, though; it was probably several months later. You might have trouble with smudging if you tried to wash them immediately, but I’m not sure. I hope this helps! And my IG is maisondepax. Hope you have fun with the project! I am new here and I think I must have missed something. 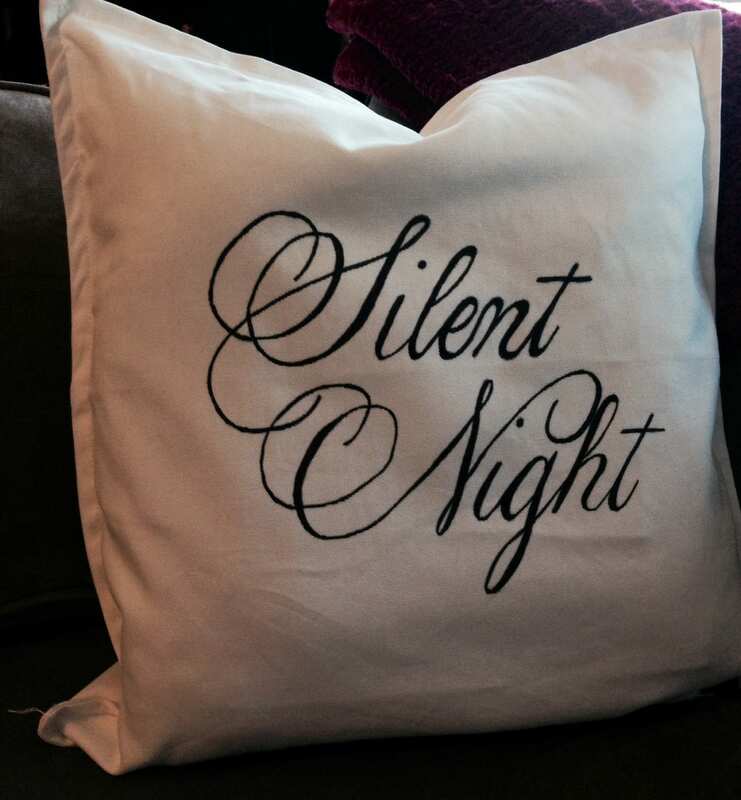 How do you transfer the beautiful script to the pillow? I understand you use a sharpie but how do you get it on the butcher paper to begin with so you can trace it? 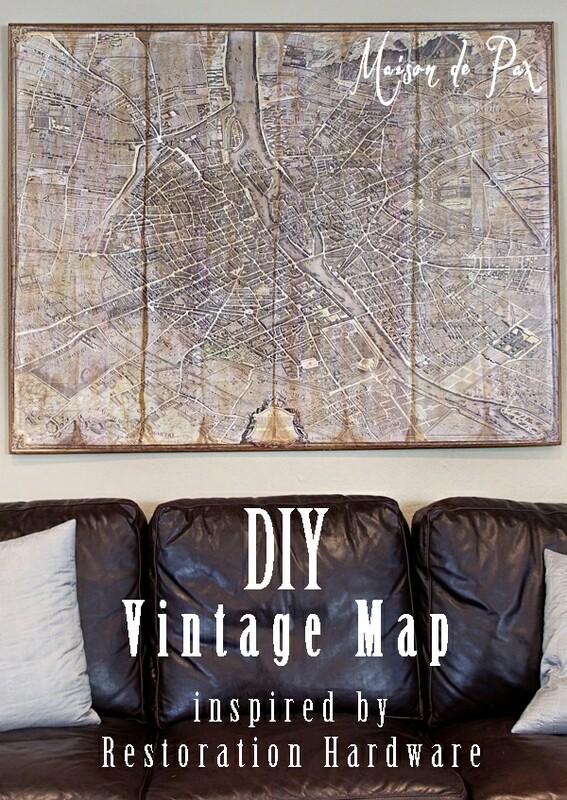 Do you just freehand it? If so, you are a true artist. I can’t imagine freehanding that script!! Love them! Hi Karen, since there were a few of us, we all used different methods. Some of us literally held the butcher paper up to the computer screen and traced some letters that way. Others freehanded the script. One of my friends has a background in calligraphy… her’s were the most beautiful. 😉 Hope this helps! So glad to have you here. before you wash, press with a hot iron. IT will help the ink to set. If they do fade after a couple of washings you can just redo with a marker. If you want a splattered effect (where the color bleeds – kinda like a tye dye effect, you can put an eyedropper of isopropyl alcohol (at least 70%) onto the fabric and it will cause the sharpie to bleed out; then set with a hot iron once it has dried. If you do this, make sure you place a cardboard or something behind your material before placing the alcohol onto the fabric so it doesn’t run onto the surface behind the fabric. These pillows are Excellent. Good work and beautiful penmanship on the script ones.